The Center for Medical Progress released another video this week, showing yet another top Planned Parenthood employee discussing their fetal parts business. The latest video features Dr. Mary Gatter, the president of the Planned Parenthood Medical Directors’ Council. In response to the first video, Planned Parenthood’s Vice President of Communications, Eric Ferrero, claimed that women actually donate their fetal tissue, and that it is done ethically and legally and with full consent. President and CEO, Cecile Richards, apologized for the tone, but ultimately defended her organization as compassionate, smearing pro-lifers. 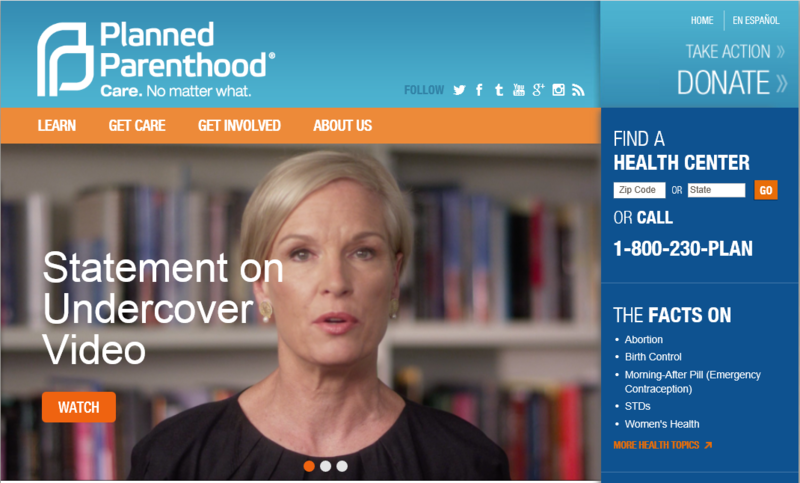 Planned Parenthood has attempted damage control through Twitter campaigns which have embarrassed the organization. In response to Congressional investigations, Planned Parenthood has once more turned to Twitter, though Twitter users have continued to turn on Planned Parenthood. Once again, a group of anti-abortion activists has attacked Planned Parenthood doctors, nurses, and patients with false accusations. And once again, its political allies are seizing on these accusations as an excuse to push the same dangerous agenda — ban abortion, shut down health centers and cut women off from care. Tell them that you aren’t fooled by the latest smear job. Tell them that you won’t stop fighting for women’s health and rights. Tell them that you stand with Planned Parenthood. The message Planned Parenthood is asking its supporters to sign is full of typical but tiring reminders of what Planned Parenthood thinks of others and the high esteem with which it regards itself. We know they’ll use any accusation, no matter how blatantly false, to force their narrow ideology on women nationwide. They’ll ignore the objective voices in media and the medical research community that have demonstrated how phony this latest attack on Planned Parenthood is. It is worth mentioning that Planned Parenthood ignores research and that one thing in common the two videos have with each other – changing the abortion method – is spoken against in the medical community. For example, what I’m dealing with now, if I know what they’re looking for, I’ll just keep it in the back of my mind, and try to at least keep that part intact…. PP: Exactly, exactly. Under ultrasound guidance, they can just change the presentation. Now to me, that’s kind of a specious little argument and I wouldn’t object to talking to asking Ian, who’s our surgeon who does the cases, to use an IPAS [manual vacuum aspirator] at that gestational age, in order to increase the odds that he’s going to get an intact specimen. But they can’t ignore us. We’ve seen this all before all right. We’ve seen it, we’ve fought it, and we’ve won. And we won’t stop fighting this time, because more than anything, we care about women — and we need your support. We care about the brave, compassionate women who have chosen to donate tissue to the cause of medical research. We care about the doctors and nurses who have dedicated their lives to serving women in their communities. And most of all, we care about the women who will be cut off from basic, lifesaving care if these anti-abortion activists get their way and manage to shut down Planned Parenthood health centers. Planned Parenthood “has won” only because they have the support of the most pro-abortion presidential administration in our nation’s history and receive half a billion dollars from taxpayers annually. Planned Parenthood claims it’s “because more than anything we care about women [that] we need your support” but it’s really a sign of a desperate defense. Planned Parenthood cares about profit. The organization only seems to acknowledge women as “brave, compassionate women” in prepared statements when it’s convenient and to their benefit. How Planned Parenthood treats women and allows buyers to treat them when it comes to their counseling and consent suggests not only that the organization is lying about consent, ethics and legality, but about their concern and care for women. Sorry Planned Parenthood, but we’re not fooled either.